Back in 1877 the first Barilla pasta was created in a small Italian pasta shop. Today the Italian pasta brand is a global player in the market, who still makes pasta with traditions kept from the old pasta shop. Regardless of this, the brand is still required to do in store display promotions. This allows current and potential customers to taste the old traditional pasta they make. The 138-year-old brand is focusing on quality more than quantity. This allows for customers to taste the product they are purchasing, the perfect way this kind of business can achieve that is by offering tastings. In store display is therefore an important factor Barilla needs to take in mind. 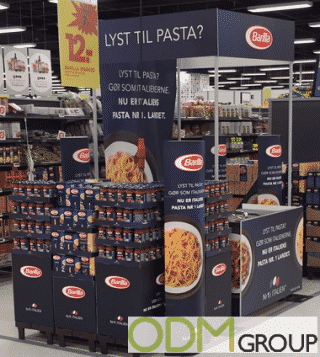 The Danish supermarket chain, Bilka is offering in store promotions for their Barilla pasta. The promotion display contains a large POS-stand with pictures and text about the company values and its quality. From the stand it is possible to cook pasta and allow for product tastings. How does Barilla Benefit from In Store Display? In store display are great marketing ideas, when planning your complete marketing approach. All businesses will find instore displays useful. For authentic food brands like Barilla, it is equally important to do promotions like this. 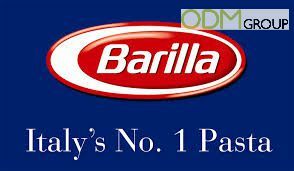 Barilla is competing in a red ocean market, with a lot of suppliers. This naturally means that promotions like this will make them more special than others. The first impression is often one of the most important things and therefore is POS in store displays like this beneficial. It will help your company to create more brand awareness and help to increase sales of the product. ODM Group already have a lot of experiences in designing and manufacturing POS displays like this. Below are some other related products you can look at for more inspiration. Det kendte kvalitets pasta-brand Barilla benytter sig nu af in store display i deres markedsføring. Det danske supermarked Bilka er med til at brande produktet. Dette er et godt eksempel på hvordan du kan øge din brand awareness maksimere din profit.